Stone face, fake rock with a face on it – I don’t know what these things are called, but I see them all over Pinterest, and I wanted one. My face rock still needs to cure some more, and I want to give it an iron sulphate stain, but it’s done enough so you can see how it was done. I really had fun sculpting that face with the cement mortar! But before you check out the video, I want to thank every one of you who responded to my last one to let me know that you do want to learn cement sculpting with me. I couldn’t answer each comment personally, but your opinions really do matter to me, and it was really heartwarming to get so many positive comments about this new (to me) sculpting medium. This video is really long, almost 25 minutes, and there are a lot of different steps. Don’t let that worry you, though, because each step is fairly easy. 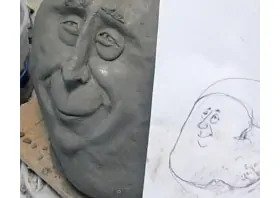 In fact, a lot of it is really familiar to all of us paper mache artists, from the way the armature for the rock is built out of crumpled paper and masking tape, to the final sculpting with the cement mortar — which is really a joy to work with because it’s so smooth. Pallet knife set I use as miniature mortar trowels. Coarse fibers used in the first mortar mix. Fine fibers used in the face coat. Sources of small packages of powdered marble and metakaolin. Sources of larger sacks (cheaper if you use a lot) of powdered marble and metakaolin. If you make anything with the cement, or if you have any questions or suggestions, be sure to leave a comment below. Hello Jonni, I followed your lead. See where it took me. Thank you for leading the way.